Thank you to everyone who entered my giveaway for the false eyelashes kit! And now for the lucky winner. And now to this week's giveaway! One lucky winner will win the World's Fastest Flat Iron by Jose Eber (140.00 value)! Quicker recovery equals less passes through hair which means less damage to the hair. Maintains high and even heat for quicker, more desirable results. Multiple heat settings for maximum control. 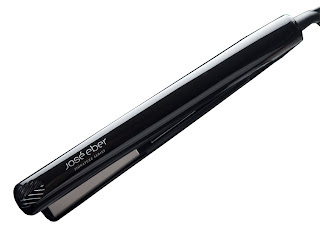 I use mine every day and I love it, and you could WIN your very own! 1. Follow my blog by clicking "join this site" or "follow by email" in the sidebar. 2. Leave a comment on this blog post with your first and last name. 3. Like Jose Eber on Facebook. 4. Pin your favorite Hair and Makeup by Steph post, tutorial, or hair style, linking back to this blog. Contest ends on Tuesday October 9th at midnight.